Miami Watersports Paradise offers Watersports Packages! 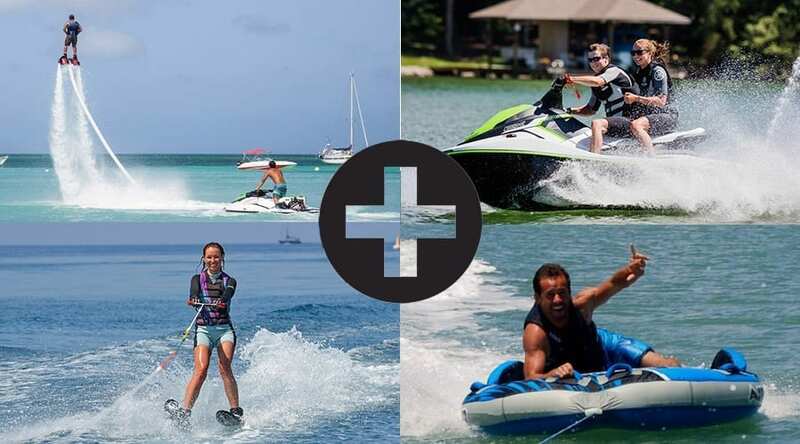 We understand that when you see the menu of Watersports activities we offer, people want to try it all! Or Sometimes, within your group, not everyone wants to to the same thing! This is why we offer 4 packages, each one with different type of activities. Pure fun, in bundle! This package includes a private boat ride around Star Island and surrounding islands and a stop at Virginia Key for snorkeling with our Easybreath Snorkeling masks! This Package includes a Boat Tour in Biscayne Bay, Paddle Boards, Kayaks, Snorkels and Masks. This Package includes a Boat Tour in Biscayne Bay, Paddle Boards, Kayaks, Snorkels & Masks and a Tubing session. This package includes a Boat tour in the Bay, a Jet Ski ride, Flyboard, Waterski, Wakeboard, Tubing, Kayak, SUP and Easybreath Snorkels! After cruising around Miami Beach, we anchor in the bay and you enjoy 1 Jet Ski, 1 Flyboard, Kayaks and SUPs right from the yacht! Fly like Iron Man and swim like a Dolphin! With our qualified instructors you will be able to fly in the air after few minutes! Learn from a knowledgeable instructor who will share his passion for the sport and teach you all the right techniques from beginner to pro. Water skiing in beautiful Biscayne Bay! Our instructors will teach you all the right techniques for bi-skis and monoski!